What to know before seeking a photo booth rental in Houston, TX. What is the difference in Photo Booth Rental Company’s in Houston, TX? I am going to tell you the difference in photo booth rental companies in Houston, TX. On the surface, photo booth rental companies do not appear much different. However, there are some things you should look for. Let’s start by considering the clients needs. Below are listed some questions that you should answer before beginning your search for a photo booth company. How big is the venue and how much room can I dedicate to a photo booth? How large do I want the photos to be? Will a photo strip suffice or do I want larger? Am I ok with something large and obtrusive or do I need something a bit more elegant? Do I need the ability for my guests to e-mail or text the photos to themselves? Am I promoting something that could use extra exposure of advertising? So the above questions are a great start in choosing the correct photo booth. Below are two examples of photo booths. There is nothing wrong with the clunky obtrusive photo booth. They both take great photos and both have their place at events. Usually the clunky ones can be rented for a lower price. 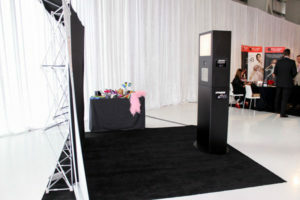 The elegant photo booth “Mirror Me” photo booth is best suited for formal events such as weddings. However, they also work well at promotional events as well. The reason brides and other clients love the Mirror booth is because the start screen (Screen that is visible when the guests approach the photo booth) can be animated and show a bride and groom photo or a company logo. Be prepared to tell your photo booth provider how many photo’s you would like on the strip or 4×6 photo template. Most companies have their prices listed on their website but typically have a bit of wiggle room on their pricing. 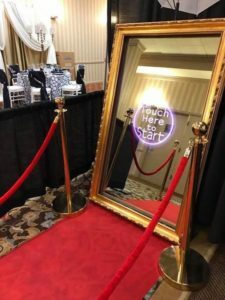 If you are interested in the Mirror Me photo booth, please visit our home page at the link above for an instant online quote! ← What to expect when taking DJ or Photo Booth gear to the HLSR Cook Off!